Dr. Parra and Dr. Thomas-Brown are identifying teaching and learning concepts for the development of an Effective STEM+C Model of Teaching and Learning, currently being referred to as Discover STEM+C. For this paper and presentation, Dr. Parra and Dr. Thomas-Brown will share this model under development along with the grant submissions under development and the Discover STEM curriculum that will be taught in spring 2016 by Dr. Parra. Dr. Parra and Dr. Thomas-Brown hope to engage the participants in a conversation that will improve the model, the course, and any other projects under development. Note from Julia Parra – The Discover STEM+C Model of Teaching and Learning is a project under development. It is, of course, premature to say that this is an effective model, EXCEPT, that it thus far, it has been an effective model for me, and I am compelled to share. The purpose of this project is to increase access to and ownership of STEM+C knowledge by K-12 teachers as a result of their engagement in challenging, personally meaningful and transformational curriculum of “extraordinary experiences.” The Discover STEM+C project builds on the three areas of promise, 1) the Experiential Science Education Research Collaboration (XSci) STEM-based experiential learning projects and research from the University of Colorado, Boulder, specifically the XNI model that stands on three legs that are specifically oriented to STEM learning – experiential learning, narrative study of lives, and science identity; 2) the existing understanding of computing and computational thinking integrated with STEM-based extraordinary experiences across interdisciplinary content areas, and 3) a focus on Geography as a STEM discipline. The XNI model is from the Experiential Science Education Research Collaboration (XSci) STEM-based experiential learning projects and research from the University of Colorado, Boulder. 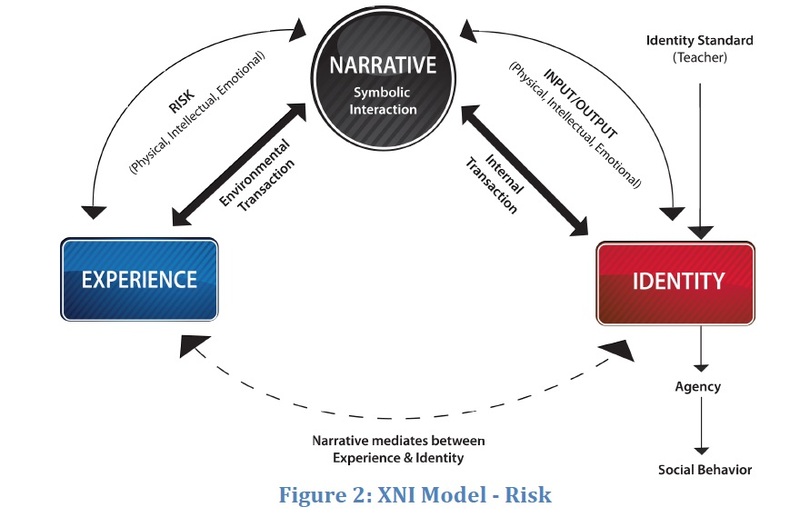 The XNI model combines three fields of study into an innovative lens for guiding research and practice: (1) Experiential learning theory (educational research); (2) The Narrative study of lives (psychology) and; (3) Identity theory (sociology). Importantly, this model situates narrative as the mediator between experience and identity as the predominant pathway for meaning making and the establishment of personal relevance to learning, a relatively innovative concept within educational contexts. For the purposes of this paper presentation, we will focus on experiential learning. 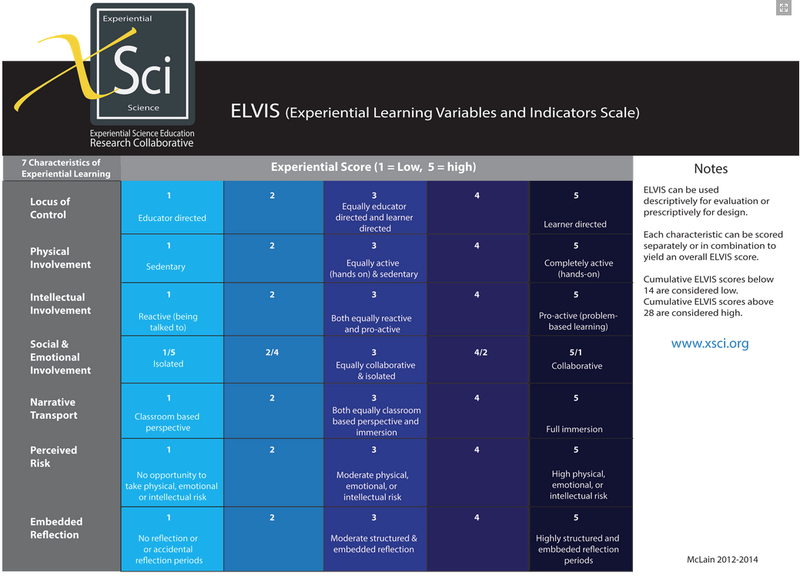 A key component for the development of Discover STEM+C curriculum is XSci’s Experiential Learning Variables and Indicators Scale (ELVIS), which is, “ a tool for designing and assessing teaching and learning efforts in terms of their “experiential-ness” and “synthesizes many of the best-known and well-researched models for experiential learning and boils them down into a very practical instrument that includes seven core characteristics of experiential learning: These characteristics include 1) locus of control, 2) physical involvement, 3) intellectual involvement, 4) social & emotional involvement, 5) narrative transport, 6) perceived risk, and 7) embedded reflection” XSci (n.d.). A major goal of Discover STEM+C is to explore the computing and computational thinking as a strategy for the learning design process of structuring and processing teacher’s learning through extraordinary experiences as well as making computing and computational thinking an integral component of what teachers do as part of the Discover STEM+ extraordinary experiences. Computing as identified by the recent, 2015 NSF STEM+C CFP broadly “refers to the whole set of fundamental concepts and skills that will allow students to creatively apply and adapt computation across a range of application domains, to ‘bend digital technology to one’s needs, purposes, and will’ (Briggs & Snyder, 2012).” Of note, this project does not fully reflect a satisfactory role for computing and computational thinking. We are seeking funding for this purpose. The National Science Foundation considers all science and engineering fields supported by that organization to be STEM fields. Geography is among those disciplines supported by research initiatives of NSF. Among the more exciting and vital emergent sub-disciplines of Geography is geospatial science, which is essentially a combination of geocomputation, geographic information science, geographic information technologies and geographic information systems applications. Ultimately it is the culmination of over 2500 years of geographic research encapsulated by the tools and methodologies of modern computer science and driving many of computer science’s more powerful scientific technologies. These technologies include autonomous vehicles, earth satellite sensing devices, geographic information systems and global positioning systems, and large networks of automated environmental probes to mention just a few. Among the hallmarks of geography as a science is that it is the only discipline that focuses on the entire earth and all of its physical systems – what once went under the moniker of “earth system science.” What makes it more relevant today than ever is that it combines the knowledge of the physical earth -(geomorphology, geology, hydrology, oceanography etc), biological (biogeography), and atmospheric conditions (climatology and meteorology) with human systems of land use and man’s impacts on the earth as well as the controls the earth places on man (human environment) into visual and intractable representations. This makes geography a very timely and relevant science in which to study the development of a sense of scientific competence in students as they incorporate existing knowledge of physics, chemistry, biology, earth science, and computational thinking. Geography as science is immediately relevant. The crucial tie in this research becomes the audience, the learners themselves. Millennial learners are not technology immigrants, the role of technology in their daily lives is indispensable, hence, rhetoric, why not incorporate more technology into their STEM learning. No only do today’s millennial learners demonstrate high levels of motivation to learn (Dede 2005), their tech-savvy adds another dimension to their learning needs and categorizations of learning styles. Hence, we are developing a model that allows for a wide range of field, and laboratory experiences; reflective experiential co-learning; and reflective engagement and analysis of narratives gleaned from lived experiences provided a holistic and well rounded approach to the development of the learners’ science identity, and in this instance geospatial literacy. Finally, geospatial science is among the most highly paid and highest demand disciplines in the United States today. The US Department of Labor estimates an annual growth of nearly 35% and the commercial geospatial sector is doubling every year (http://www.doleta.gov/BRG/Indprof/geospatial_profile.cfm). There is a growing demand in homeland security, regulated industries (e.g. utilities, telecommunications, transportation and education) as well as many private enterprises. In the context of this proposal, being able to show the learner that what they are learning has immediate application will enhance their level of enthusiasm to learn science. Geography is an ideal STEM discipline for STEM+C endeavors. The aim of the proposed curriculum is to, 1) help teachers advance from a lack of comfort with STEM+C ideas to an ability to develop and share STEM+C content as a result of profound personal STEM+C-based experiential learning, and 2) is for teachers to experience the power of computational thinking and computing for processing and enhancing their STEM experiences. The curriculum will include a set of activities, computational tools, and outcomes that can be utilized by teachers for their own learning and for designing learning opportunities for their own students. use apps to control Sphero robot balls; and use the web and computation to find answers to their questions. In addition computational thinking will be used as a basis for understanding their STEM experiences and solving problems suggested by the teachers during and after their experiences. They will learn to create abstractions at appropriate levels; collect data to help solve problems and answer geospatial scientific questions; and use editing devices to create simulations and movies about aspects of the geospatial STEM experiences and reflections. Teachers will be able to use CT models such as data-driven analysis and algorithmic thinking to design solutions to problems they have identified in their experiences. In order to provide an example of the kind of experiential and reflection activities, Dr. Julia Parra, has developed a sample of what a STEM+C teacher professional development intervention might look like. Engage with the Discover STEM+C Pedagogical Models including the app for ELVIS. This lake adventure combines the exciting sport of Stand-Up-Paddleboarding and/or Kayaking (no experience necessary) with STEM+C activities and documentary filmmaking using Go-Pro camera systems. This experience includes an educational cross section of geography, lake and marine ecology, the physics of buoyancy and hydrodynamic design, human-environment interaction in lake environment, documentary filmmaking and STEM+C-related personal narrative, Go-Pro camera operation, and editing software. Engage in post-experience activities to support reflection and the take-aways for personal individualized classroom use. This curriculum project started as a small idea for a class and grew into a collaborative project – the submission of a grant proposal for NSF STEM+C, currently under review. By sharing this paper at the NCGE 2015 Conference, we hope to share the concepts for this collaborative curriculum project and receive feedback from participants. Bok, D. (2005). The critical role of trustees in enhancing student learning. The Chronicle of Higher Education,12, 16. Brickhouse, N. W., Lowery, P., & Schultz, K. (2000). What kind of a girl does science? The construction of school science identities. Journal of research in science teaching, 37(5), 441-458. Briggs, A., & Snyder, L. (2012). Computer science principles and the CS 10K initiative. ACM Inroads, 3(2), 29-31. Hersh, R. H., & Merrow, J. (Eds.). (2005). Declining by degrees: Higher education at risk. New York: Macmillan Publishing. Hunter, A. B., Laursen, S. L., & Seymour, E. (2006). Becoming a scientist: The role of undergraduate research in students’ cognitive, personal, and professional development. Science Education, 91(1), 36-74. Grossman, T. (2009). Building a High-Quality Education Workforce: A Governor’s Guide to Human Capital Development. Washington, D.C.: National Governors Association Center for Best Practices. Hour of Code. (Code.org, 2014). Kilpatrick, J., Swafford, J., & Findell, B. (2001). Adding it up: Helping children learn mathematics. Washington, D.C.: National Academy Press. Kolb, D. A. (1982). Experience, learning, development: The theory of experiential learning. Upper Saddle River, NJ: Prentice Hall. National Mathematics Advisory Panel. (2008). Foundations for success: The final report of the National Mathematics and Science Advisory Panel. U.S. Department of Education. National Research Council. (2005). Rising Above the Gathering Storm. Washington, D.C.: National Academies Press. National Research Council. (2010). Rising Above the Gathering Storm: Revisited; Rapidly Approaching Category 5. Washington, D.C.: National Academies Press. Papert, S. (1972). Teaching children thinking. Programmed Learning and Educational Technology, 9(5), 245-255. Resnick, M. (2012). Reviving Papert’s Dream. Educational Technology, vol. 52, no. 4, pp. 42-46. Smith, K. A., Douglas, T. C., & Cox, M. F. (2009). Supportive teaching and learning strategies in STEM education. New Directions for Teaching and Learning, 2009(117), 19-32. Thomas, W. P., & Collier, V. P. (2002). A national study of school effectiveness for language minority students’ long-term academic achievement. Valdez, A., Trujillo, K., & Wiburg, K. (2013). Using technology to support middle-school mathematics instruction: Math Snacks ratio and number line concepts. Journal of Curriculum and Teaching, 2, 154-161. Van Driel, J. H., Beijaard, D., & Verloop, N. (2001). Professional development and reform in science education: The role of teachers’ practical knowledge. Journal of research in science teaching, 38(2), 137-158. Vogt, C. M. (2008). Faculty as a critical juncture in student retention and performance in engineering programs. Journal of Engineering Education, 97(1), 27-36. Weinberg, J. B., Pettibone, J. C., Thomas, S. L., Stephen, M. L., & Stein, C. (2007, June). The impact of robot projects on girls’ attitudes toward science and engineering. In Workshop on Research in Robots for Education. Wing, J. M. (2008). Computational thinking and thinking about computing.philosophical transactions of the Royal Society A: Mathematical, Physical and Engineering Sciences, 366(1881), 3717-3725. Zweben, S., & Bizot, B. (2014). 2013 Taulbee Survey. COMPUTING, 26(5).